CoPilot is the missing link in your talent management software. It’s an exciting new platform for managing employee relocations. 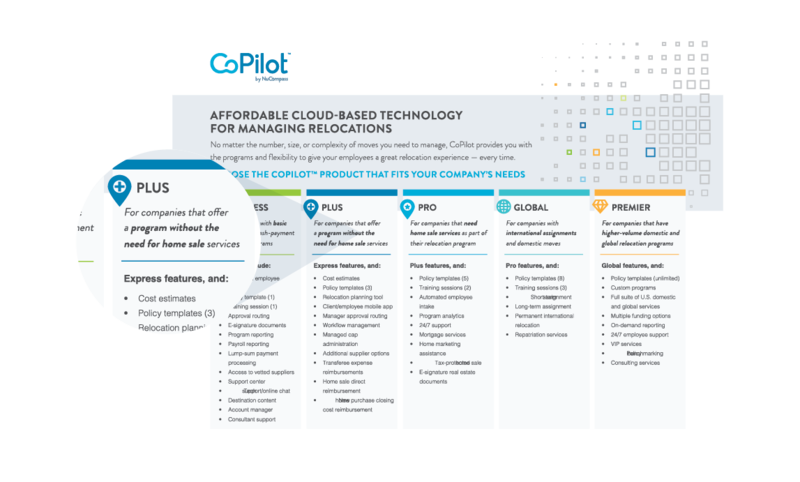 CoPilot reduces your costs while simplifying the relocation process. You and your employees are supported, every step of the way, by the professionals at NuCompass. Explore our different products, which we can match to different organizational needs. Express offers an upgrade over a lump-sum program with easy company management and access to vetted suppliers with online tools for their move. Plus offers a robust U.S. domestic relocation package. It’s appropriate for lump sums, renters, and homeowners who get reimbursed for limited real estate expenses. Pro is a full U.S. domestic relocation package that includes everything in the Plus package, but adds tax-protected real estate services, such as Guaranteed Buyout and Buyer Value Option. Global adds international assignment, permanent international relocation, and repatriation services to the Pro package. Premier is the ideal solution for companies with higher-volume, multiple-policy relocation programs with high customizability for services offered. View our complete list of products for a successful mobility program. Not sure which CoPilot product is best for your organization? Just answer these questions and get an instant recommendation. It looks like CoPilot is the best choice for you. Learn more about what CoPilot offers.